Want to Make America Great Again? 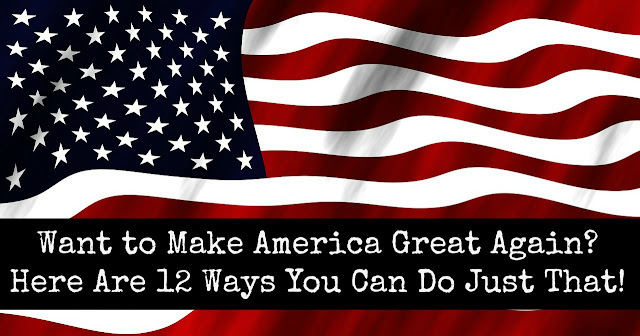 Here Are 12 Ways You Can Do Just That! A lot of my Facebook news feed this morning has been how the country has been let down by our newly elected President. This is a guy who promised to make America great again. However, he is not who is going to make America great again. You know who is going to make America great again? The American people are what make America great. However, we have forgotten this. We have forgotten that we, the people, are the ones who make this great country what it is. Our elected leaders set the policies and laws for which we live under and follow, but they are not entirely responsible for making America great. We, however, are the representatives of this country and we are the ones responsible for making America great. So how can we make America great again? 2. Smile at everyone and say hello to all you meet. 3. Be polite to everyone even if they do not deserve it. 4. Offer to help your family, friends, and neighbors. Take care of each other. Take a meal to the sick. Mow the lawn for the injured. Take care of our military families and veterans. Feed the homeless. 5. Take care of your surroundings. Do not litter. Recycle. 6. Learn to rely on yourself to take care of yourself. Do not depend upon the government or other agencies to save you. While help is great, sometimes you will not get help. 7. Raise your children to honor and respect our flag, say the Pledge of Allegiance, sing The Star Spangled Banner, and to be proud to be an American. 8. Remember that no one is better than you and you are not better than anyone else regardless of anything. 9. Take care of the elderly, learn from them, and treat them like your grandparents. 10. Honor and respect our traditions, our Constitution, our Declaration of Independence, and our history. 11. Show respect for our military, veterans, and police officers who work diligently every day to protect you. 12. Follow and obey the laws of our land. If you disagree, then respectfully disagree without causing a riot or massive damage to other peoples' properties and businesses. Seems pretty simple, right? Be a good citizen and ambassador of this great country and we will make America great again!